Highways England’s chief executive has pledged to increase its use of automation and offsite construction during the next road investment period as ministers published a £600bn pipeline of infrastructure spending. The Government’s National Infrastructure and Construction Pipeline includes schemes announced in the Budget such as the £28bn National Roads Fund and flagship projects such as upgrading the M6 to an all lane running smart motorway and East West Rail. The Treasury said that to increase efficiency in these projects ministers are encouraging greater use of more modern approaches to construction, including manufacturing components in factories using the latest digital technology prior to assembly on construction sites. It added that, despite significant contributions to the UK economy, the construction sector’s productivity is weak compared to sectors like manufacturing. The Government has committed to increasing use of modern techniques in public-funded projects and launched a call for evidence on a ‘New Approach to Building’. 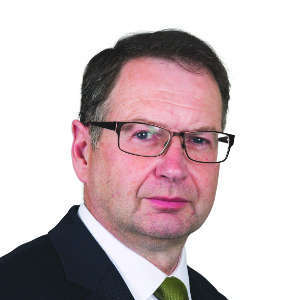 Highways England chief executive Jim O’Sullivan (pictured) said: ‘At Highways England we recognise the productivity and efficiency challenges that the U.K. construction industry is facing. In recent years we have encouraged more computer-led design, automation, and pre-assembly across all of our construction activities. ‘As well as driving productivity and efficiency, it improves worker safety and reduces delays and frustration for road users passing through our works. Robert Jenrick, exchequer secretary to the Treasury, said: ‘As the pace of technological change accelerates, we are stepping up our commitment to digital infrastructure, use of data to drive greater productivity and embrace new methods of construction. 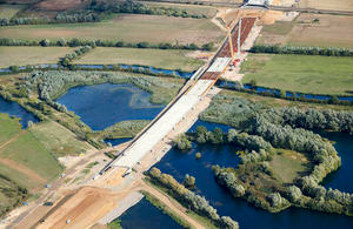 As a positive example of modern construction techniques, the Treasury cited the the A14 Cambridge to Huntingdon improvement scheme (pictured), where parts of bridges were developed in a factory and therefore built more efficiently than using traditional methods.